Although poor, he was envied by all, for he owned a beautiful white horse. Even the king coveted his treasure. A horse like this had never been seen before—such was its splendor, its majesty, its strength. People offered fabulous prices for the steed, but the old man always refused. “This horse is not a horse to me,” he would tell them. “It is a person. How could you sell a person? The man was poor and the temptation was great. But he never sold the horse. “You old fool,” they scoffed, “we told you that someone would steal your horse. We warned you that you would be robbed. You are so poor. How could you ever hope to protect such a valuable animal? It would have been better to have sold him. You could have gotten whatever price you wanted. No amount would have been too high. The old man responded, “Don’t speak too quickly. Say only that the horse is not in the stable. That is all we know; the rest is judgment. The old man spoke again. “All I know is that the stable is empty, and the horse is gone. The rest I don’t know. Whether it be a curse or a blessing, I can’t say. The people of the village laughed. They thought that the man was crazy. and dragging it out of the forest and selling it. He lived hand to mouth in the misery of poverty. Now he had proven that he was, indeed, a fool. After fifteen days, the horse returned. He hadn’t been stolen; he had run away into the forest. Not only had he returned, he had brought a dozen wild horses with him. Once again the village people gathered around the woodcutter and spoke. “Old man, you were right and we were wrong. The man responded, “Once again, you go too far. Say only that the horse is back. State only that a dozen horses returned with him, but don’t judge. How do you know if this is a blessing or not? You see only a fragment. Unless you know the whole story, how can you judge? You read only one page of a book. Can you judge the whole book? You read only one word of a phrase. Can you understand the entire phrase? “Life is so vast, yet you judge all of life with one page or one word. All you have is a fragment! Don’t say that this is a blessing. No one knows. “Maybe the old man is right,” they said to one another. So they said little. But down deep, they knew he was wrong. They knew it was a blessing. Twelve wild horses had returned with one horse. With a little bit of work, the animals could be broken and trained and sold for much money. The old man had a son, an only son. The young man began to break the wild horses. After a few days, he fell from one of the horses and broke both legs. Once again the villagers gathered around the old man and cast their judgments. “You were right,” they said. “You proved you were right. The dozen horses were not a blessing. The old man spoke again. “You people are obsessed with judging. Don’t go so far. Say only that my son broke his legs. Who knows if it is a blessing or a curse? It so happened that a few weeks later the country engaged in war against a neighboring country. All the young men of the village were required to join the army. Only the son of the old man was excluded, because he was injured. Once again the people gathered around the old man, crying and screaming because their sons had been taken. There was little chance that they would return. The enemy was strong, and the war would be a losing struggle. They would never see their sons again. “You were right, old man,” they wept. “God knows you were right. This proves it. Your son’s accident was a blessing. His legs may be broken, but at least he is with you. The old man spoke again. “It is impossible to talk with you. You always draw conclusions. No one knows. Say only this: Your sons had to go to war, and mine did not. No one knows if it is a blessing or a curse. No one is wise enough to know. The old man was right. We only have a fragment. Life’s mishaps and horrors are only a page out of a grand book. We must be slow about drawing conclusions. We must reserve judgment on life’s storms until we know the whole story. 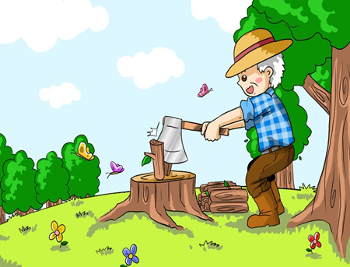 I don’t know where the woodcutter learned his patience. Perhaps from another woodcutter in Galilee. He should know. He is the Author of our story.